Hall of the Mountain King: Review: Alestorm, "Black Sails at Midnight"
Scottish pirate metal outfit Alestorm has to be one of the best musical discoveries I've made in years. Their debut record, "Captain Morgan's Revenge," was one of my favorites of 2008, and their latest outing "Black Sails at Midnight" is even better. 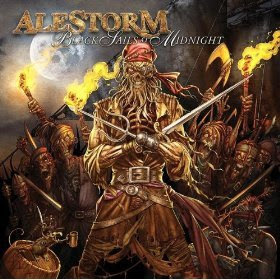 After teasing fans with the "Leviathan" EP, which featured two of the songs from "Black Sails at Midnight," ahead of a U.S. tour earlier this year, Alestorm has unleashed 10 tracks with nary a skip to be found. The biggest thing you'll notice on this record is that the band seems to be getting very comfortable with a signature sound. The first record had a lot of folk, but also had a few straight thrash numbers. The influence is still there on "Black Sails at Midnight," but every song here features some sort of folk metal touch. There's also a maturing (well, as mature as guys wearing pirate outfits can get) of the songwriting here that's perhaps most noticeable on the soft, clean guitar work that opens semi-ballad "To the End of Our Days." It's so delicate that it seems out of place on this raucous record, but that's what makes it so striking. While the rest of the song shows some of the weaknesses in Christopher Bowes' salty dog vocals, it's undeniably piratey. Unlike "Captain Morgan's Revenge," which had a few duds, every song on "Black Sails at Midnight" works, and there's a pleasing variety. The record opens with the blistering guitar riffing of "The Quest" which sets the energy level high. "Leviathan" provides an epic, seafaring number. "Pirate Song" is a storytelling tune that has a bit of sea shanty in it. The soaring instrumental "No Quarter" shows off the band's musical prowess and proves that it's not just the lyrics that make this "pirate metal." Guitarist Dani Evans, who has switched over from bass, gets the spotlight on the song, and impresses. There are also some nice nods to songs from the last record in "No Quarter," particularly a melodic bit pulled from "Set Sail and Conquer." Bowes also gets credit for his keyboard work. In general, I think keyboards don't belong in metal, but I'll make an exception for these, which are perfect and give the songs the feel of a pirate movie soundtrack. It's particularly solid on "Chronicles of Vengeance," where the keys are the primary instrument. If you don't take your metal too seriously, check out "Black Sails at Midnight." I guarantee you won't have more fun listening to a metal record this year. Get "Black Sails at Midnight."